We ask that you park your vehicle on the gravel area and not next to your chalet as the soft sand does not allow much protection for the underground water/sewage pipes and traffic going over them can cause them damage. At Stoer Bay chalets we understand that for many your dog is part of your family. All we ask is that your dog is kept under control and is not left unattended in your chalet. All doggy poo must be bagged and binned immediately. 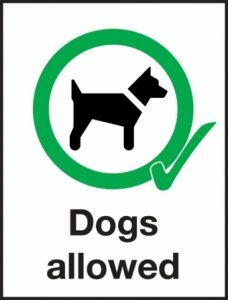 Please be aware that the chalet grounds though securely fenced are surrounded by open crofting land where livestock wander freely, if there is any risk of your dog worrying livestock please keep it on a lead at all times. Please ensure that your dog is kept off the chalet furniture at all times and if necessary is rubbed down before entering the chalet (a towel will be provided). Please use any BBQs with caution. Hot coals must not be disposed of in the refuse bins. Please dispose of any coals considerately. BBQs should not be used on any surface that could pose a risk of fire or scorching such as decking, grass or furniture or in close proximity to our chalets Never use a BBQ inside a chalet. Please use bins in the kitchen as marked to ensure we can do our bit for the environment and recycle all we can. The large bin outside your chalet is for non recycleables, the blue bin by the office/store is for recycleables. Glass should be put in the bin beside the blue bin. Thank you for helping us care for the environment. Please do not use bleach for cleaning and only non bio powder or liquid for the washing machine or please use the eco egg provided. Information can be found at the back of your chalets welcome pack about eco eggs. Please put nothing but human waste and our toilet paper provided down the toilet. A bin is provided for everything else. In the kitchen it’s very important that any food waste and fat is binned not put down the sink. These small acts will all help ensure that our septic tank system will operate as it should and not spoil your stay by becoming blocked. You are responsible for keeping the property, furniture, fittings, equipment and other contents in and on the property in the same state of repair, condition and cleanliness as at the commencement of the let (reasonable wear and tear excepted). You are responsible for reimbursing the owners for the actual costs of any breakage or damage in or to the property along with any additional costs that may result. The owners reserve the right to ask anyone to vacate at any time without a refund, if antisocial behaviour causes a disturbance to other guests or local residence. On occasion general maintenance may need to be carried out within the chalet grounds. We would always however endeavour to cause as little disturbance as possible to your holiday.